Having Bullhorn as both a customer and partner has spurred CloudCall to design voice and messaging capabilities for staffing and recruiting firms. No other vendor is as tightly integrated with Bullhorn to minimize clicks and capture more actionable data. 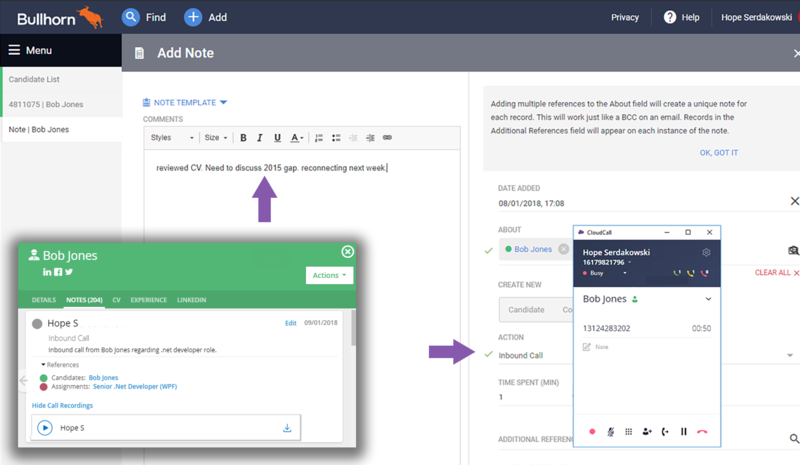 Make more calls with click to dial and an integrated outbound dialer, send and store candidate SMS messages, view call recordings inside of Bullhorn, and much more. To avoid phone tag, you often need to take or make calls from your own mobile device, not just when you are at your desk. With the CloudCallGO! Application, your mobile device takes and makes calls using your work number. Your call activity and your notes are stored in Bullhorn automatically. With CloudCallGO! you no longer have gaps in your Bullhorn records. CloudCall allows a team to roll through a common curated list. The ability to drop a pre-recorded voicemail speeds things even more. Leave a message even as you are dialing the next call. Which of the dozens of people you left a voicemail for is calling now? What did you want to discuss with them? Never again stall for time while searching for caller information as you pick up a call. Instead, wow callers with how on top of everything you always are. CloudCall’s Inbound Screen Pop not only identifies the caller (or potential callers if from a main number), it also presents recent notes to provide context for the call. Even well-intentioned people cut corners when things get hectic. CloudCall reduces the friction involved with properly documenting calls. As the call starts, CloudCall automatically updates the Bullhorn contact log and displays the linked Bullhorn notes page. Completed call logs and notes, along with call recordings, let executives pinpoint and address issues early on. 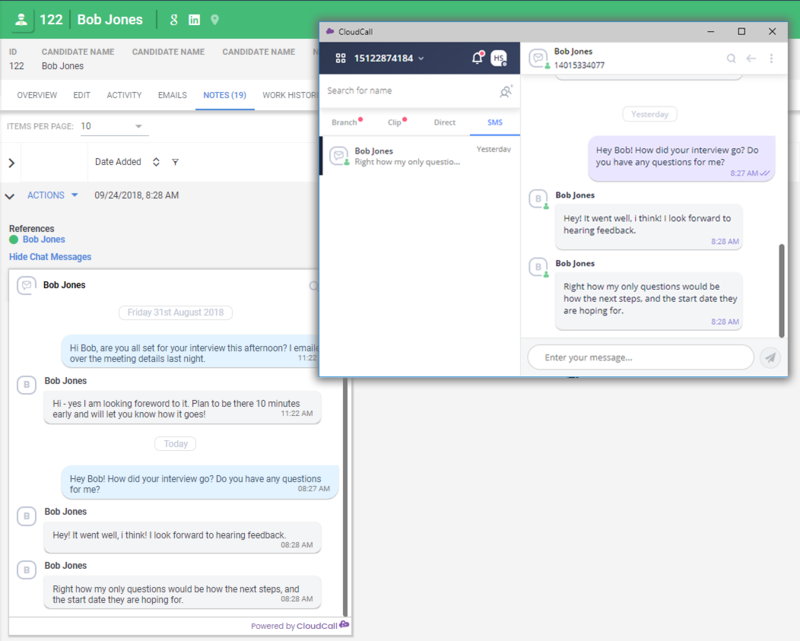 Onboarding speeds up, accountability is enforced (no more phantom call notes), and staff success boosts retention. 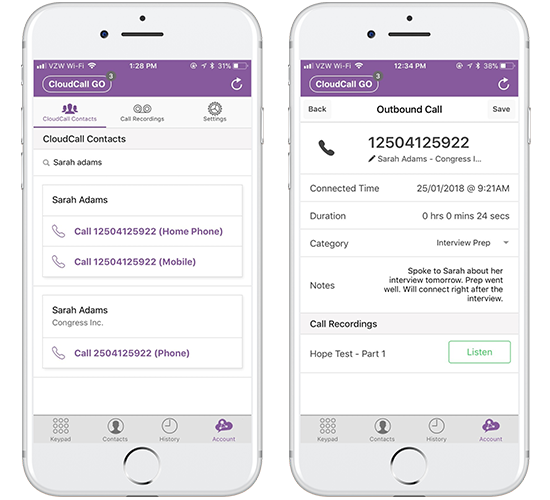 CloudCall brings instant messaging, Texting, and Voice into one interface; as full, searchable conversations are saved in candidate records. Send texts to individual numbers or broadcast messages to lists within Bullhorn. 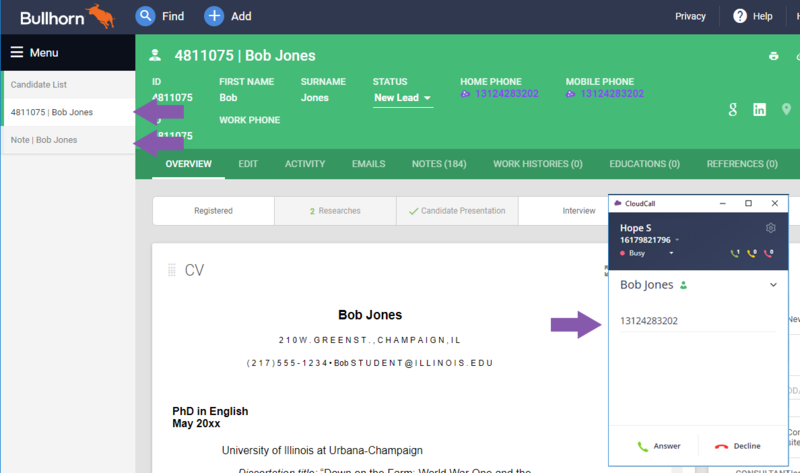 Capture all conversations between recruiters and candidates – whether voice or text – to arm your teams with the data needed to monitor, measure, and tune your business. 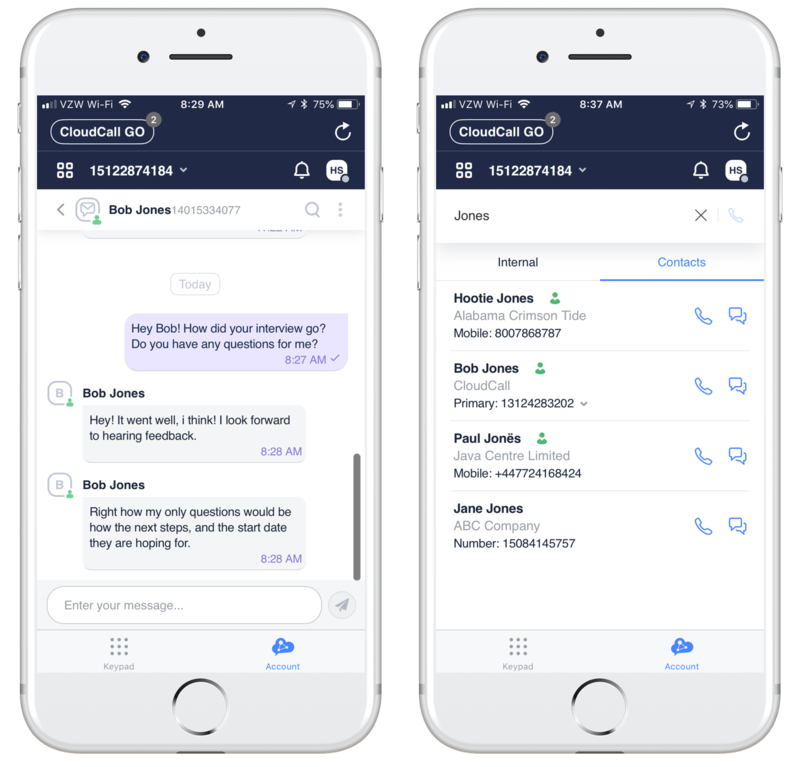 Combine integrated Texting and IM with CloudCall’s VoIP service for a fully unified and integrated communications platform - or use with your company’s existing phone service. 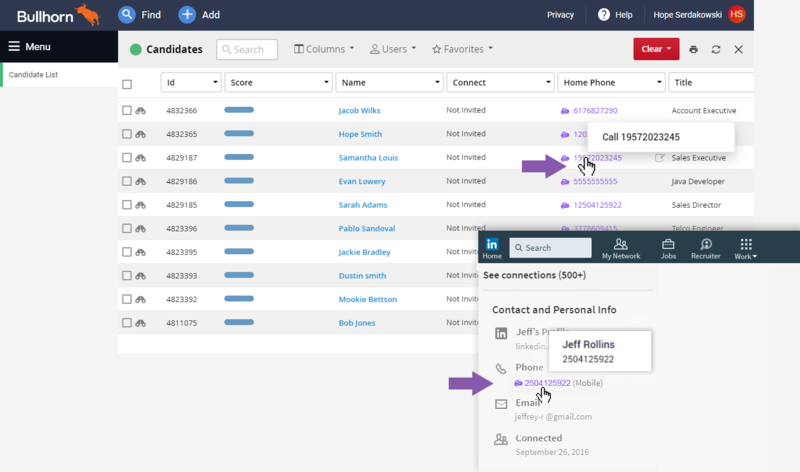 Simply click on any phone number in Bullhorn, LinkedIn, other web pages and the call is automatically dialed and logged. The associated record and notes page automatically pop up; linked to that contact’s record. 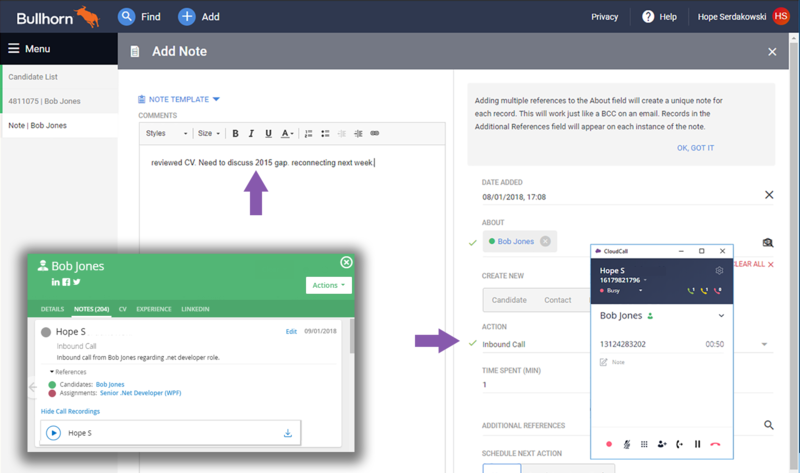 CloudCall allows a team to roll through a list in Bullhorn. Use the integrated CloudCall for Bullhorn Dialer to tackle tear sheets in record time. To be even more productive, leave a pre-recorded voicemail message as you are dialing the next candidate. Which of the dozens of people you left a voicemail for is calling now? What did you want to discuss with them? Never again stall for time while searching for caller information. As you pick up a call CloudCall’s Inbound Screen Pop not only identifies the caller (or potential callers if from a main number), but it also pops open all details through the Bullhorn record. Have more meaningful conversations with all of the details in front of you. Even well-intentioned people cut corners when things get hectic. CloudCall reduces the friction involved with properly documenting calls and texts. 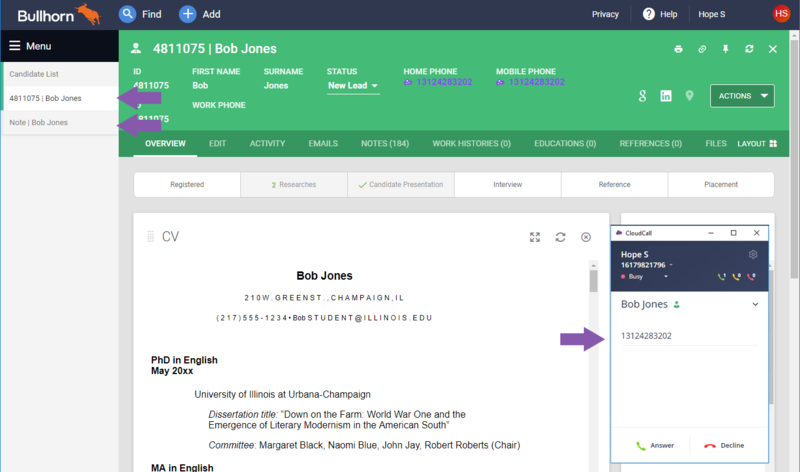 As the call starts, CloudCall automatically updates the Bullhorn contact log and displays the Bullhorn notes page. Management can pinpoint and address issues early on with completed call logs, notes, SMS messages, and call recordings stored in Bullhorn. Onboarding speeds up, accountability is enforced while staff success boosts retention. To avoid phone tag, you often need to take or make calls and texts from your mobile device. With the CloudCallGO! Application, your mobile device takes and makes calls, texts, and internal instant messages using your work number, while your call activity and notes are automatically stored in Bullhorn. Utilize the same interface and functionality of the desktop application while on your mobile phone, to remove gaps in Bullhorn records.